PJ Harvey was asked to do this for the BBC historical drama Peaky Blinders, according to NME. Harvey’s cover is very different from the Australian alternative rock band’s original song. While in the original, Cave’s very deep voice booms across the sound of instruments which hold tension and drums that come in very harshly, Harvey’s cover is slow and subtle. A piano creates the main tune. Harvey’s voice sounds sad, compared to Cave’s voice which holds warning and is strong. There are many points where the vocals in the cover echo which creates an eery effect. Harvey’s cover is just a different breed altogether, taking on a new aspect to Cave’s song which was creepy originally, but not quite in the way Harvey has played with it. Before this, Harvey’s last release was her protest single “Shaker Aamer” in August 2013. 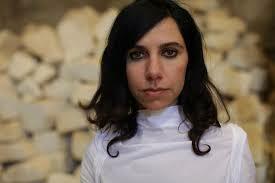 Her last studio album Let England Shake was released in 2011.
via LISTEN: PJ Harvey Covers Nick Cave’s “Red Right Hand” | mxdwn.com News.